NEW YORK (August 2, 2017) ― Consumers today often desire shower experiences that invigorate their senses, while also seeking varying design options to make a customized style statement in their bathroom sanctuary. The new GROHE Euphoria Cube, Tempesta and Retro-Fit shower systems provide unmatched performance and innovative technology for consumers with refined taste. The Euphoria Cube shower system introduces pure geometric form to the shower environment, and is engineered for maximum comfort and dependable safety. Geometric design is a long-term trend that continues to inspire architects and contractors to design modern bathrooms. Taking the concept of minimalism to the next level, the new Euphoria Cube shower system introduces pure geometric form to the bathroom environment. Completely devoid of curves and cylindrical elements, the new Euphoria Cube shower system coordinates strikingly with the square-shaped RAINSHOWER 230 Allure fixed showerhead and the purist Euphoria Cube hand shower with the GROHTHERM thermostat. It combines all the benefits of a rain showerhead and hand shower into a single product engineered for maximum comfort and dependable safety. The new shower system sets the standard for modern bath design with its pronounced edges, simple surfaces and consistently parallel lines. The Euphoria Cube shower system has a Manufacturers’ Suggested Retail Price (MSRP) of $945. 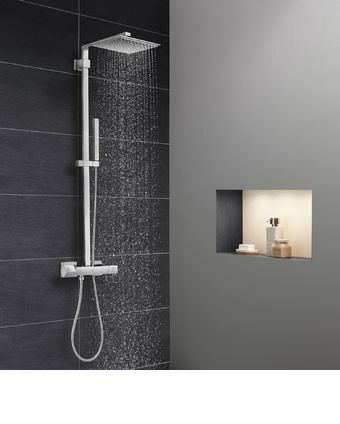 Ideal for families with small children, the GROHE Tempesta Shower System is built to withstand the rigors of daily use. Whether you are looking for a contemporary-organic, modern-geometric or classically ornate design, the new GROHE Tempesta shower system complements any bathroom ambiance and faucet style. Representing state-of-the-art shower engineering, it is built to withstand the rigors of daily use, making it ideal for families with small children. 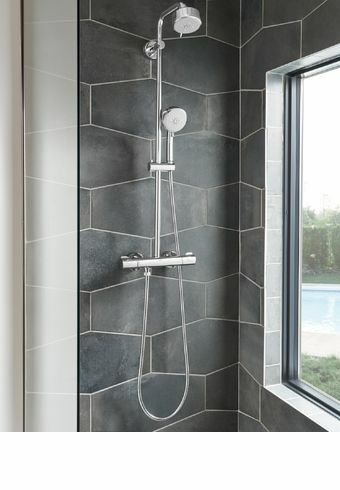 The system includes an exposed thermostat with SafeStop to help prevent scalding, an Aquadimmer volume control diverter for easy switching between overhead and hand shower, and an adjustable-height holder to suit all size users. The shower system can be paired up with the New Tempesta Cosmopolitan 100 showerhead and hand shower. Whether you prefer a soft rain shower, pulsating massage, or a firm, stimulating jet, the Rain GROHE Rain O2, massage and jet spray patterns provide the water flow intensity to fit your mood. The new GROHE Tempesta shower system provides an attractively priced, urban chic-styled product line for the modern bathroom. For added comfort, it includes the brand-exclusive GROHTHERM thermostat, plus features GROHE Turbostat, which reduces the risk of hot and cold shocks resulting from fluctuating water pressure. Its sleek, minimalist design lines are highlighted by GROHE StarLight, which ensures long-lasting sheen and protection against scratching and stains. While delivering a first-rate shower experience, the GROHE Tempesta shower system also takes care of the environment. Models are available with the innovative GROHE EcoJoy technology, which allows users to save water on a daily basis without compromising their shower experience. The GROHE Tempesta shower system has an MSRP of $495. When it comes to bath and shower renovations, consumers and contractors prefer to avoid heavy construction. The GROHE RetroFit shower system provides an easy upgrade for the shower by transforming an existing showerhead installation with concealed pressure balance valve into a luxurious shower system without breaking the wall. The Retro-Fit shower system is now available in a brush nickel finish for those who seek timeless style and beauty, with an MSRP range of $595 to $729. To learn more or find a retailer near you, visit www.grohe.us or call (800) 444-7643. Euphoria Cube®, GROHTHERM®, Rain O2®, SPEEDCLEAN®, GROHE StarLight®, Tempesta®, GROHE Turbostat®, are registered trademarks of GROHE AG. Allure™, SafeStop™, Aquadimmer™, Cosmopolitan™, GROHE EcoJoy™, RAINSHOWER™ and Retro-Fit™ are trademarks of GROHE AG.